Download and install intertops Go to the intertops home page by clicking the download button below. Once there, download and install the intertops software. Create Your intertops Account: After you click through our link you will find yourself on the intertops homepage. Select the 'Sign Up Now' button and create your new intertops account. 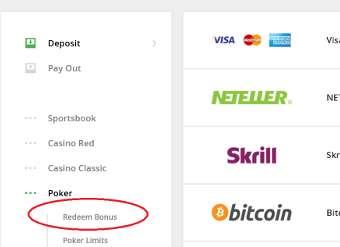 When depositing, select the 'Redeem Bonus' button and enter our code, TN1000, to claim your sign-up bonus. Intertops is a popular, growing skin on the Horizon Poker Network that hosts some of the best cash games and tournaments around. Players that register through TheNuts will receive 36% rakeback for their play, paid daily right to their intertops account. A 200% up to $1,000 first deposit bonus also awaits in addition to a healthy lineup of promotions that include rake races, freerolls, and other giveaways that add value to your daily play. In addition, intertops permits players to exchange their Gold Chips for instant cash payments. Register today and take advantage of all that intertops has to offer.